How to display more than 50 records per page? Open Microsoft Dynamics CRM 4.0. Click Tools from the Top Menubar and select Options. On the General tab change "Set the number of records shown per page in any list of records." This personal setting applies per user. How to add Sales, Marketing, Service & Scheduling areas in my workplace? On the Workplace tab select the areas you want to display. You can only see areas that you are intended to see based on your security roles. 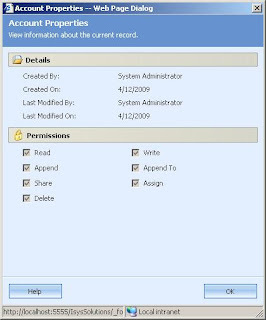 How do I know the privileges I have over a record in Microsoft Dynamics CRM 4? Suppose you are on an Account form. Click on the Office button on the top left corner.